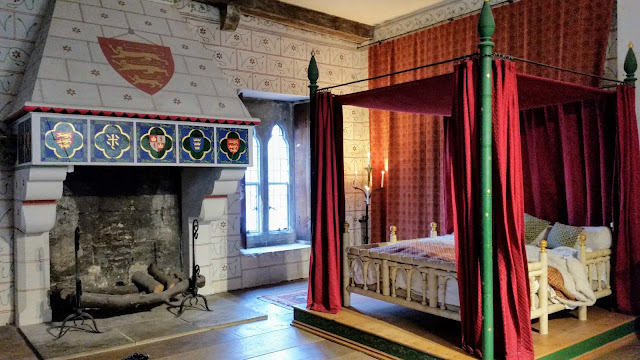 King Henry III had the Wakefield Tower constructed, which would become the King's lodgings, and then had the Lanthorn Tower built, to act as the Queen's lodgings. The moat was extended and new curtain walls were also added. The Byward Tower, with a drawbridge, was built and became the main entrance to the Tower complex. Between 1238-1272 ten more towers were added; The Middle, Salt, Martin, Deveraux, Flint, Brick, Constable, Broad Arrow, Bowyer and Garden. The latter would later be renamed the Bloody Tower. Edward I had St. Thomas's Tower built to act as his royal lodgings, adding a river entrance, known as Traitor's Gate. The Well, Beauchamp and Develin Towers were soon added, too. St. Tomas's Tower, the Wakefield Tower and the Lanthorn Tower are what make up what is now known as the Medieval Palace.